It gets knocked down, but it gets up again. 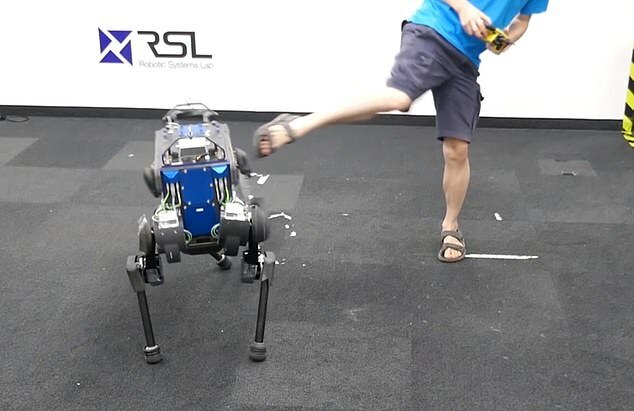 A team of Swiss researchers have trained a robot dog to be able to fight off repeated kicks from a human. No matter how many times the robot, called the 'ANYmal,' gets kicked, it's able to roll over onto its back and stand back up again. The researchers' findings were laid out in a new paper published Wednesday in Science Robotics. Scientists from Switzerland's ETH Zurich University trained the robot using artificial intelligence, which enables it to move and respond faster than ever before. So fast, they say, that it was able to beat the previous speed record by 25 percent. According to researchers, this is not an easy thing to do. 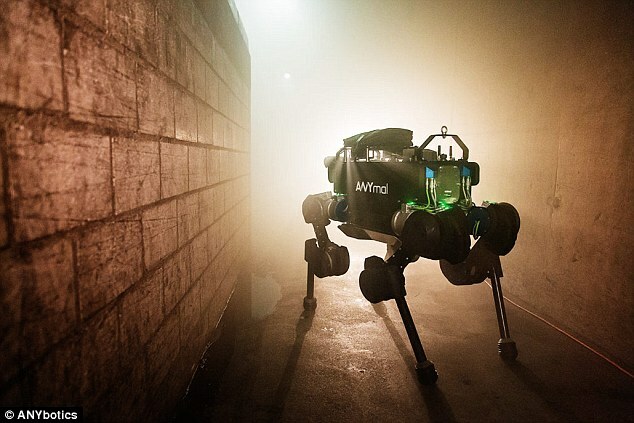 'Legged robots pose one of the greatest challenges in robotics,' the study notes. Typically, researchers rely on simulations, which are 'cheap and safe,' but cannot 'accurately capture the dynamics of complex robots,' they explained. Instead, scientists developed a neural network system from which the robot would be able to quickly learn and adapt. 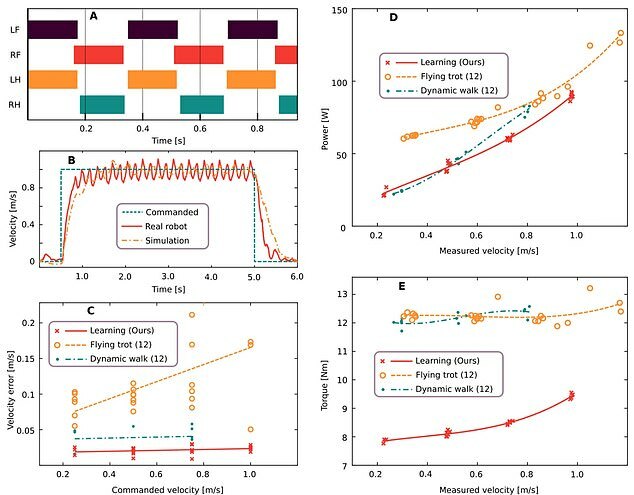 'Using policies trained in simulation, the quadrupedal machine achieves locomotion skills that go beyond what had been achieved with prior methods: ANYmal is capable of precisely and energy-efficiently following high-level body velocity commands, running faster than before, and recovering from falling even in complex configurations,' the study continues. It also uses a relatively new method called reinforcement learning, where the robot basically learns through trial and error, completing a series of tasks over and over until it gets it right. A video posted by ETH Zurich shows one of the researchers kicking the robot several times, in some cases pretty forcefully. At several points throughout the video, the robot's limbs are so quick to adjust that it doesn't even fall over. If it does tip over, the scientists said they created a 'roll-over motion' where the robot dog is able to recover from a fall. The scientists say this 'roll-over' method has never been observed in a similar four-legged robot like ANYmal until now. With the ability to survive a fall, it means that four-legged robots could be even more useful to humans in the future. 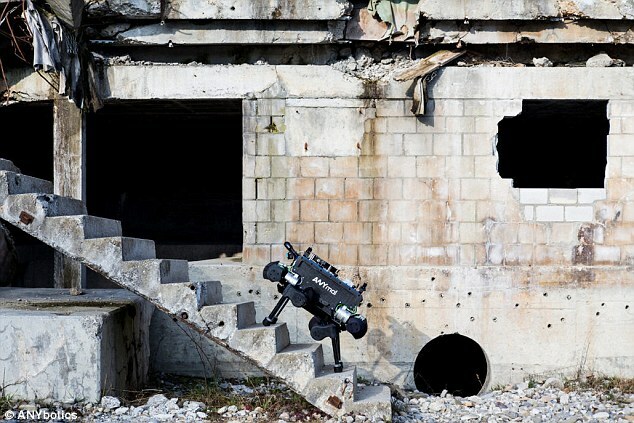 'Legged robots may one day rescue people in forests and mountains, climb stairs to carry payloads in construction sites, inspect unstructured underground tunnels, and explore other planets,' the study notes. This isn't the first time we've seen ANYmal in action. ANYbotics, the commercial version of ETH Zurich's robotics unit, trotted the four-legged robot dog out on the show floor at the Consumer Electronics Show in Las Vegas earlier this month. There, as part of a partnership with tiremaker Continental, the companies demonstrated how ANYmal could soon be able to deliver packages to consumers' doorsteps. A robot dog was able to jump out of a concept van, clamber over a garden in front of a model home and make its way up a set of stairs to the door. From there, it slides the package off its back and onto the front porch, before ringing the fake doorbell with one of its arms. After delivering the package, it was even able to do a little dance.